Microsoft is pushing out a new Windows 10 Insider preview build 15019 for PC. The latest Windows 10 Creators Update (Redstone 2) PC build 15019 is now rolling out for fast ring insiders. There is no insider release of Windows 10 mobile build 10.0.15019.1000. The latest insider build brings a bunch of new features as well as bug fixes and other improvements. However, few Insider members may face issues like download stuck at 0%’ and other problems with this build. Read here for fixes. Previously, the company released Windows 10 PC build 15014 and mobile 10.0.15014.1000 for insiders. Xbox Gaming Features: The new Gaming section in system settings is now available with new options. Built-in Beam streaming: You can now stream your gameplay with Beam. This new feature is now available on both PC and Xbox One. You can start Beam broadcasts by pulling up the Game bar — Windows + G.
Game Mode: Our vision is that Game Mode optimizes your Windows 10 PC for an improvement in game performance. To enable Game Mode, go to Settings > Gaming > Game Mode toggle the feature on. Doing this will give you the ability to enable the feature for each UWP and Win32 title you play by pulling up the Game bar (Windows + G) and the clicking the Settings button. 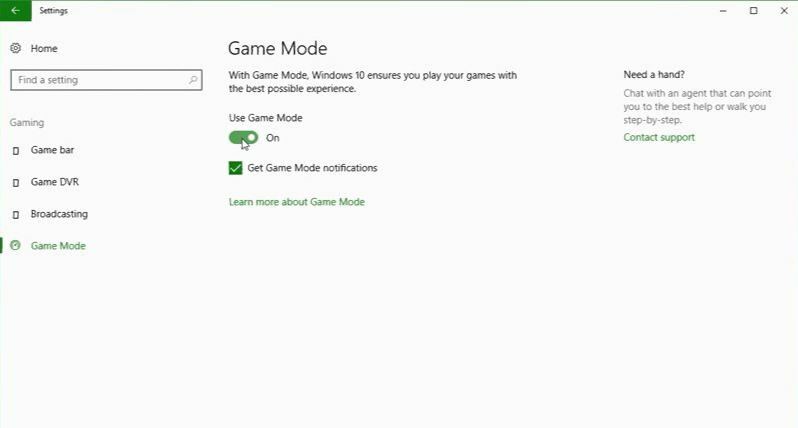 Check here for more details about Game Mode and how to enable it on Windows 10. Microsoft Edge can now read aloud: By pressing the “read aloud” button at the top-right corner after opening one of your e-books and listen to Microsoft Edge read you the book with focus on the line and the word being read along. This feature is also extended to all non-store EPUB files opened using Microsoft Edge. Microsoft Edge and emoji: Microsoft Edge will now display full-color, updated emoji by default on websites that use emoji. Continuing our progress towards a more inclusive OOBE: The new Windows Out-Of-Box-Experience (OOBE) brings new features. 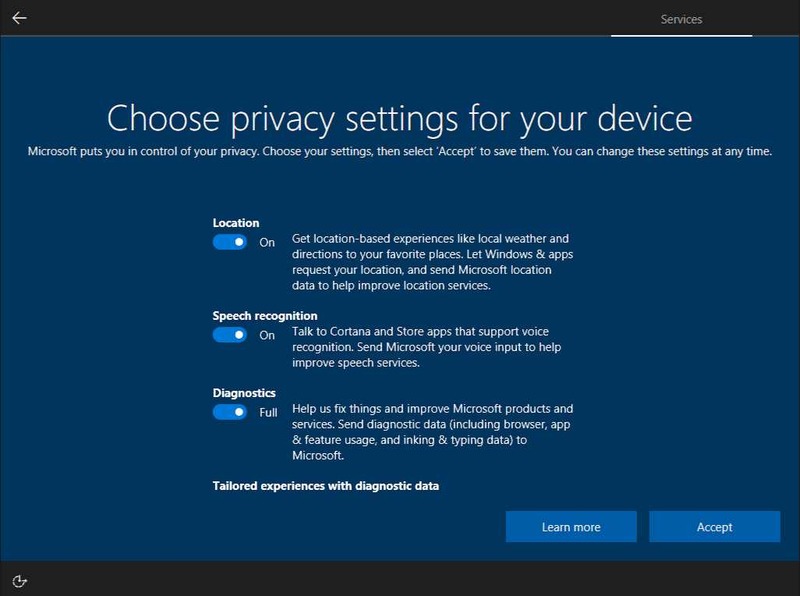 Privacy: The new privacy settings now available with Windows 10 insider build 15019. Wi-Fi Captive Portal: The Wi-Fi connectivity experience in OOBE has been updated to support “captive portal” Wi-Fi networks. When connecting to such a Wi-Fi hotspot, OOBE will navigate to a lightweight browser experience allowing you to complete the connection and reach the internet. We’ve also included some updates allowing you to configure some basic properties for the Wi-Fi network during OOBE. MSA Sign-in/Sign-up: The Microsoft Account (MSA) Sign-in and Sign-up flows in OOBE are now updated to the new design for the Windows 10 Creators Update. Users will see that these experiences are paginated and simplified will help in reducing the overall cognitive load and in improving accessibility in the MSA sign-in/sign-up experiences. Windows Hello enrollment: Users can now enroll into Windows Hello using the new design implementation for the Windows 10 Creators Update with Cortana voiceover and support for speech input. Updated voice: The audio track in this build is recorded by voice actors, so it is much friendlier and the intonations are better too (compared to the synthetic voice track we had in Build 15002). Subtitles: The primary purpose behind this redesign of OOBE is to be inclusive and improve accessibility. This build supports subtitles to ensure that our deaf/hard of hearing users are also included in the new Cortana voiced OOBE. Bug fixes and visual polish: This build also has improvements for visual polish and a good number of bug fixes which help in overall stability. Windows 10 insider build 15019 fixed an issue where right-clicking the night light quick action from the Action Center and selecting Settings brought up the Settings home page and not the night light specific setting. 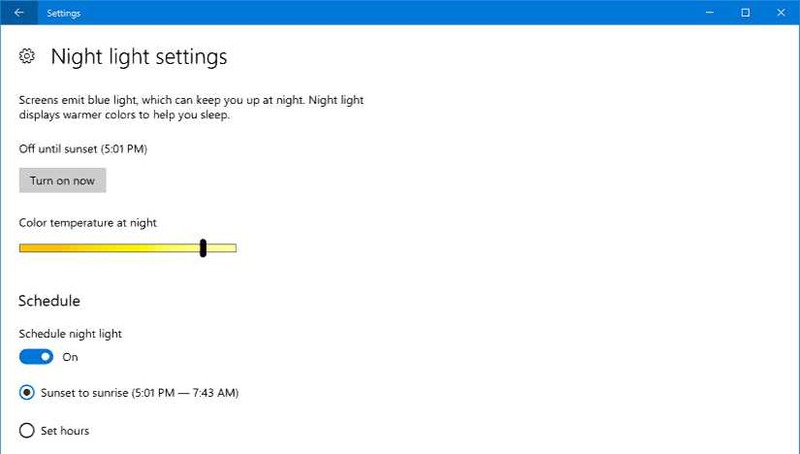 Windows 10 insider build 15019 fixed an issue where waking your device from sleep or connecting a new monitor would not have the night light setting applied correctly. Windows 10 insider build 15019 fixed an issue where explorer might hang after waking a device if night light was enabled. Resize your Virtual Machine Connection in Hyper-V: You can now quickly resize VMConnect by dragging the corners of the window and the guest operating system will automatically adjust to the new resolution. Store app and game download progress in Action Center: With latest insider build 15019 downloaded apps and games from the Store will now show download progress inside of the Action Center. 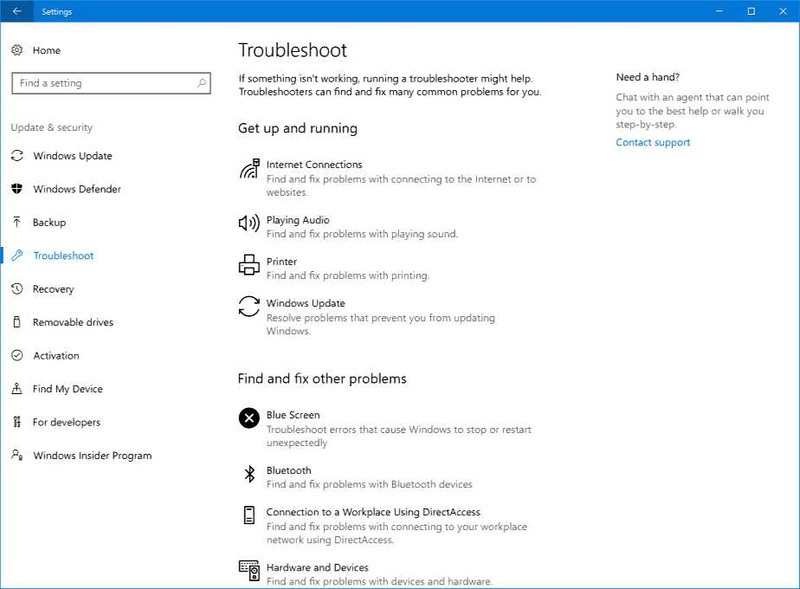 Improved discovery for Troubleshooters: T Windows Insider team is rolling out new refreshed troubleshooting settings. can find and fix many common problems for you. With Build 15019, the new Troubleshooters section of Control Panel has been migrated into Settings. Head to Settings > Update & security > Troubleshoott. Windows 10 insider build 15019 fixed an issue where connecting an Xbox 360 or Xbox One Controller to your PC would cause the DWM to crash, resulting in your display flickering and/or appearing blank or black. Windows 10 insider build 15019 fixed an issue where with certain games if you used Alt + Tab to change focus to a different window, you could see both the newly focused window and the game flicker. Windows 10 insider build 15019 fixed an issue where when using Microsoft Edge with Narrator, you might hear “no item in view” or silence while tabbing or using other navigation commands. fixed an issue where pasting on top of selected text in a Web Note would result in Microsoft Edge crashing. Windows 10 insider build 15019 fixed an issue that prevented some users from viewing Twitch.tv streams in Microsoft Edge. Windows 10 insider build 15019fixed an issue from recent builds where Microsoft Edge would crash when sharing a PDF. Windows 10 insider build 15019 updated the e-book viewer in Microsoft Edge so that if you’ve clicked on an image, you can now Ctrl + Mouse wheel to zoom. Windows 10 insider build 15019 fixed an issue where typing [ into the F12 Developer Tools window wouldn’t work when using the Hungarian keyboard. Custom scaling has been migrated from Control Panel to now be a subpage in Display Settings. Windows 10 insider build 15019 fixed an issue where Taskbar preview icons were unexpectedly small on high-DPI devices. To help save characters when typing in fields with a character limit, we’ve added a new ellipsis child key for Latin-based languages (such as English, German, and French) when you press and hold the period key on the touch keyboard. fixed an issue where in certain UWP apps, tapping outside of a text box currently with focus while in tablet mode wouldn’t dismiss the touch keyboard. fixed a typo in the new compatibility option to override high DPI scaling behavior for GDI-based apps. Windows 10 insider build 15019 fixed an issue where newly pinned secondary tiles (for example, a pinned page from Settings) would unexpectedly appear in Start’s Recently Added list. Windows 10 insider build 15019 polished the animation when moving tiles in and out of folders on Start, and fixed an issue where it wasn’t possible to drag the final tile out of a folder onto the same row as the folder tile. Windows 10 insider build 15019 fixed an issue from Build 15014 where using Hey Cortana might result in SpeechRuntime.exe using an unexpected amount of CPU. fixed an issue where, with a maximized Notepad window and enough text to require a scrollbar, the right-most edge of the scrollbar wouldn’t do anything when dragged in an attempt to scroll. fixed an issue where, after pressing Alt to set focus to the menu bar, certain apps could become unresponsive if then pressing Ctrl or clicking inside the app’s child window. fixed an issue where Cortana might crash when slowly typing out a UNC path that has already been typed out and opened through Cortana once before. fixed an issue where Default apps Settings would crash of you clicked an app under “Choose default app” and selected the option to look for an app in the Store. Windows 10 insider build 15019 updated Themes settings page to now contain a link to the Store to find more themes to download. fixed an issue where certain apps might crash after using the Open dialog to rename and open a folder. fixed an issue where Win + Shift + S wouldn’t work if the mode in Snipping Tool was set to something other than Rectangle. Fixed an issue where you could end up with multiple Snipping Tool processes open after using Win + Shift + S and hitting Esc to stop the snip. We fixed an issue where certain file attributes, such as +s, would be lost when copying or moving a folder to a different partition. Fixed an issue where using Command Prompt with certain fonts could result in conhost.exe unexpectedly using a lot of CPU. Windows 10 insider build 15019 updated Dial Settings to now list customized apps alphabetically. fixed an issue with Windows Ink where undoing and redoing a point erase could result in the ink reappearing in an unexpected order. Windows 10 insider build 15019 improved Screen Sketch copy reliability. fixed an issue some insiders may have experienced recently with the mouse and keyboard sometimes going unresponsive for a few seconds at a time. fixed an issue resulting in certain apps crashing when you switched to Tablet Mode. fixed an issue where calendar appointments marked as Tentative or Out of Office were showing up as Free in the Taskbar clock and calendar flyout. fixed an issue where, if multiple folders were selected in Background Settings under Slideshow mode, slideshow would not work. fixed an issue where you could see the page flash when navigating from and back to Themes Settings. fixed an issue where the Bluetooth & other devices Settings page unexpectedly said “Systemsettings.Viewmodel.settingentry” at the bottom. Windows 10 insider build 15019 improved Settings reliability. fixed an issue where, when using Phonetic as the sorting method with the zh-tw display language, the clock on the lock screen wouldn’t appear. Windows 10 insider build 15019 adjusted the look of the Virtual Touchpad to make the left/right buttons more visible. We’ve fixed an issue that could result in the Netflix app crashing on launch. Try again and it should work. We also fixed an issue where on certain hardware types, the Netflix app would crash when starting a movie. The game DOTA2 should now launch normally. 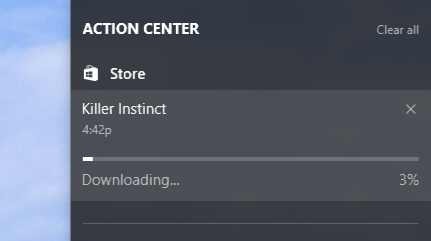 IMPORTANT: The download progress indicator shown when downloading this build is currently broken under Settings > Update & security > Windows Update. It may look like you’re getting stuck at 0% or at other percentages. Ignore the indicator and be patient. The build should download fine and the installation should kick off. See this forum post for more details. After updating to this build, nonstop exceptions in the Spectrum.exe service may occur causing PCs to lose audio, disk I/O usage to become very high, and apps like Microsoft Edge to become unresponsive when doing certain actions such as opening Settings. As a workaround to get out of this state, you can delete C:\ProgramData\Microsoft\Spectrum\PersistedSpatialAnchors and reboot. For more details, see this forum post. Some Windows Insiders may have had trouble connecting to certain Google sites due to an implementation of a new security model being rolled out to further enhance user security. The team is working on a resolution. In the meantime, users can access these sites from an InPrivate tab. Extensions in Microsoft Edge do not work in this build. Extensions may appear to load but will not function as expected. This issue should be fixed in the next Insider release build we release. If you depend on extensions in Microsoft Edge, we recommend skipping this build. You can pause Insider Preview builds by going to Settings > Updates & security > Windows Insider Program, clicking on “Stop Insider Preview builds”, and choosing “Pause updates for a bit”. Microsoft Edge F12 tools may intermittently crash, hang, and fail to accept inputs. Microsoft Edge’s “Inspect Element” and “View Source” options don’t correctly launch to the DOM Explorer and Debugger, respectively. Windows Insiders will unexpectedly see a “Mixed Reality” entry on the main page of Settings. Some captive portal Wi-Fi networks may fail to connect during OOBE. If a captive portal network is using DNS hijacking to redirect to a secure site, the captive portal app will crash and the user cannot clear the portal. Yes/No voice commands in the Wi-Fi portion of OOBE are currently failing. Note: Please take caution when editing the registry. Changing the wrong value can have unexpected and undesirable results. Dragging apps from the all apps list to pin on Start’s tile grid won’t work. For now, please right-click on the desired app in order to pin it. Some Tencent apps and games may crash or work correctly on this build. Under Settings > Update & security > Windows Update you might see the text “Some Settings are managed by your organization” even though your PC isn’t being managed by an organization. This is a bug caused by an updated flight configuration setting for Insider Preview builds and does not mean your PC is being managed by anyone. On some PCs, audio stops working sporadically with ‘device in use’ error”. We are investigating. Restarting the audio service may fix things for a bit. The Action Center may sometimes appear blank and transparent without color. If you encounter this, try moving the taskbar to a different location on screen. Popular games such as may experience crashes or black screens when trying to load due to a platform issue. When clicking on certain elements in desktop (Win32) games, the game minimizes and cannot be restored. Game Mode is enabled system wide by default, however, the ON/OFF toggle in Settings will incorrectly show it as being OFF until the user manually toggles the Setting to ON which will cause it to update and accurately display the status of Game Mode system wide. Broadcasting to Beam via the Game bar currently requires a number of Privacy settings to be changed. Certain hardware configurations may cause the broadcast live review window in the Game bar to flash Green while you are Broadcasting. This does not affect the quality of your broadcast and is only visible to the Broadcaster. Recently, the company also released a new cumulative update KB3213986 build 14393693 for PC and mobile build 10.0.14393.693 for Windows 10 Anniversary Update users and cumulative update KB3210721 build 10586.753 for Threshold 2 users. Finally, Windows 10 build 15002 ISOs are now available for download. You can download ISO from here. However, if you are looking for Windows 10 build 15019 ISO, you have to wait further. Currently, official Windows 10 build 15019 ISO is not available.